On last Friday the security agents and police forces of the regime assaulted on Iran Writers Association's 50th anniversary and prevented the association to hold its 50th anniversary . 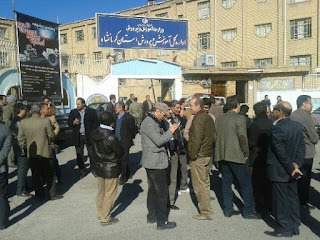 hours before the event to take place the security agents and police forces attended at the location where the event was going to take place and surrounded the streets and area , prevented the guests and members or public to attend at the location. 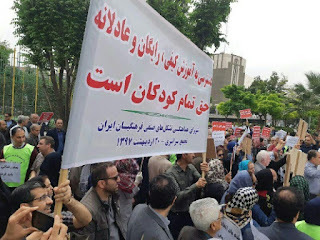 The security agents with the letter from ministry of judiciary assaulted on the location of the event and arrested the event organizers and confiscated the posters and other valuable items which was prepared for the event. 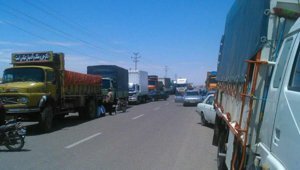 Transportation truck owners and drivers from all over Iran gone on strike since Tuesday . The result of this strike : Increase on Gas and Line up in Gas stations . 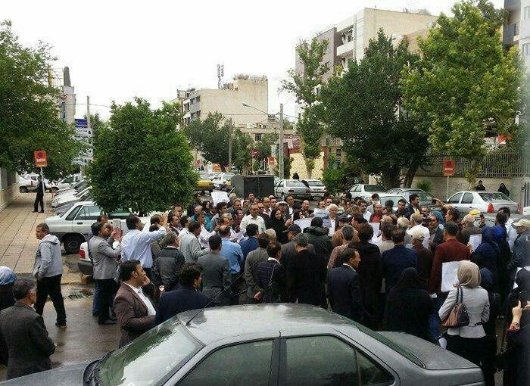 According to news hundreds of women and men from the city of Kazeroun protested overnight on the evening of Wednesday against the regime decision to divide the city . As a result many have been killed or wounded and arrested in the city . According to one news between 2- 5 people have been killed by the security forces . On the 70th anniversary of the Nakba, Palestinians’ forced displacement following the creation of Israel, FIDH and its member organizations in Palestine and the occupied Syrian Golan Al Haq, Al Mezan, Al Marsad, PCHR and RCHRS, strongly denounce the killings by the Israeli forces of dozens of Palestinians and injuries of thousands exercising their right to peaceful demonstration. Our organizations renew their call to stop immediately the use of excessive force against peaceful protesters. The international community shall take strong measures against Israel to put an end to the ongoing international human rights and humanitarian law violations amounting to war crimes and establish an independent and transparent investigation into the Israeli forces’ use of live fire and snipers. We urge all states to stop their military cooperation with Israel. We also reiterate our condemnation of the unlawful relocation of the US embassy from Tel Aviv to Jerusalem ahead of the commemoration of the Nakba. For the seventh week in Gaza, Palestinian unarmed protesters demanding an end to the unlawful closure of the Gaza strip and stressing the right of return for refugees who were forced to escape from their land 70 years ago were once again met with disproportionate violence by Israeli security forces. The “Great March of Return”, which started on 30 March and is due to continue until 15 May, marking the 70th anniversary of the Nakba, also demands an end to the 50 year occupation by Israel and stands against the relocation of the American embassy to Jerusalem. Since 30 March, Israeli forces killed 100 Palestinians in protests, including 11 children, two journalists and three persons with disability. 6,938 were injured, including 1,244 children, 253 women, 42 paramedics, and 59 journalists. On Monday 14 May alone, 59 Palestinian protesters were killed and at least 2,000 were injured, including 304 children, 77 women, ten journalists, and three paramedics . Unarmed protesters, including numerous women and children, have been met with excessive force by the Israeli armed forces using live ammunition from snipers and tank fire, rubber bullets and gas grenades . The Israeli snipers deliberately and selectively opened fire at the participants in the peaceful protests, who posed no threat to the lives of Israeli soldiers . Israeli armed forces’ use of excessive force against unarmed civilians who practice their legitimate rights to expression and peaceful assembly, and preventing civilians from seeking medical care, constitute serious and deliberate violations of international humanitarian law and a direct infringement of UN Security Council Resolutions. According to the UN High Commissioner for Human Rights, Israel’s actions in the context of Gaza amount to willful killings, which may be prosecuted as war crimes by the ICC . The Prosecutor of the ICC is currently carrying out a preliminary examination into the situation in Palestine to prosecute and hold political and military officers accountable, in order to avoid further violations and to ensure justice. The Prosecutor of the ICC must accelerate her ongoing preliminary examination and open an investigation without further delay. As Palestinians continue to protest in the “Great March of Return”; on May 14, ahead of the Nakba, the US government has unlawfully relocated its embassy from Tel Aviv to Jerusalem in violation of international law . The international community has never recognized any part of Jerusalem as Israel’s capital, and deemed the annexation of occupied East Jerusalem illegal. The relocation of the embassy will entrench Israel’s impunity for its widespread violations against Palestinians’ right to life, to freedom of movement, freedom from ill-treatment and to dignity . Our organizations stress that the prohibition of annexation of land acquired by force is a main pillar of international law and international peace and security that must be safeguarded by international community. Our organizations assert that the continued targeting of unarmed protesters is gravely concerning and call upon the international community, the UN, the EU and state representatives, to exert pressure on Israel to respect its obligations under international humanitarian law; demand Israel fully lifts its unlawful 11 year closure and blockade of the Gaza Strip; condemn Israel’s use of lethal force against Palestinian unarmed protesters; demand that Israel guarantees access to international investigators to look at the deaths of hundreds of Palestinian protesters in Gaza since 30 March; and urgently intervene to ensure Palestinians’ rights and dignity. Our organizations calls upon UN officials and state representatives not to a engage with US officials in Jerusalem upon the embassy’s opening. The inaction and absence of a political will by the international community and Israel to ensure respect for international humanitarian law will only exacerbate the conflict and allow for the chronic denial of human rights and justice to continue. It is essential that the international community takes immediate action to protect the civilian population in Gaza, who are practicing their undeniable rights to freedom of expression and assembly. Accordingly, measures must be adopted to bring to an end Israel’s fifty year occupation of the Palestinian territory and ensure Palestinians’ right to self determination, and the recognition of the right of Palestinian refugees to return, as mandated by international law. (Beirut, May 15, 2018) – The Iranian judiciary should immediately halt the looming execution of a member of the Gonabadi Dervish community, Human Rights Watch said today. 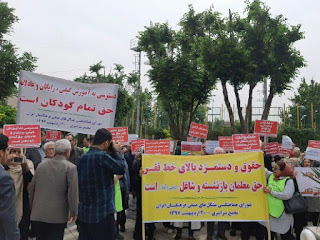 Iran should also release all Dervish members arbitrarily detained since February 2018. 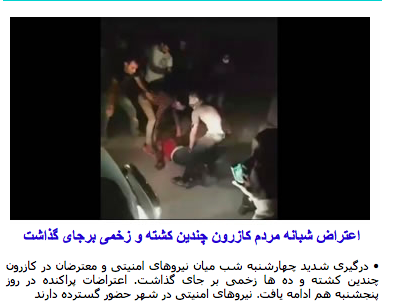 The authorities arrested more than 300 members of the Dervish community on February 20 following clashes when the authorities violently repressed a peaceful protest in Tehran. The clashes left dozens injured and three police officers and another security force member dead. 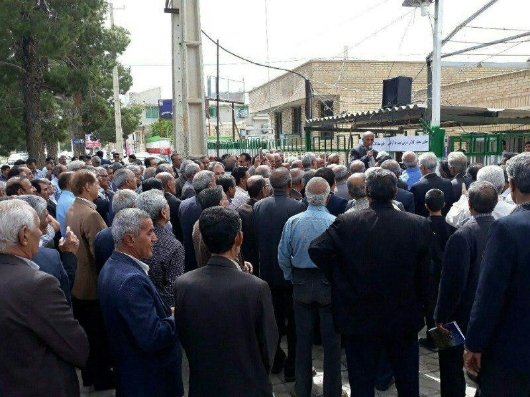 On March 18, after an unfair trial that lasted three sessions, the authorities sentenced Mohammad Sallas, 46, to death on charges of killing the police officers by driving a bus into a crowd of security officers. 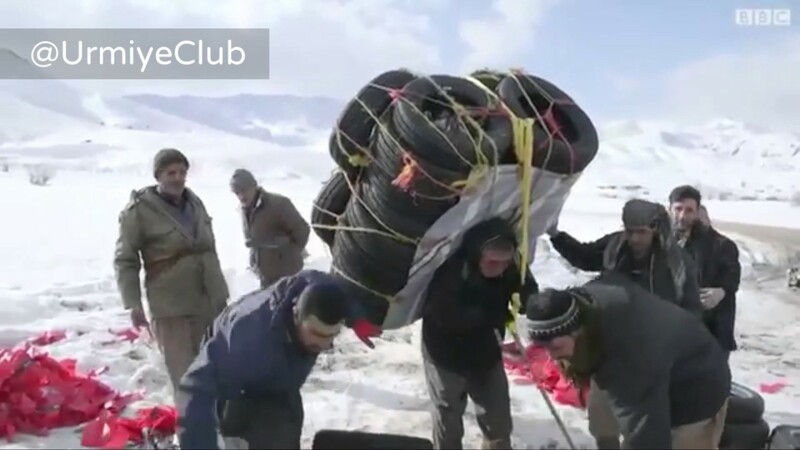 According to news in the past two days , more than 40 local environmentalist and two wildlife defenders from the city of Bandar Lengeh have been arrested and detained by regime security agents /forces . In the past year regime intelligence agents have arrested so many environmental activist and wildlife defenders on a baseless accusation of espionage . Hassan Ragh and Aref Zare are the two wildlife defenders from Bandar Length , Bastak and Larestan . 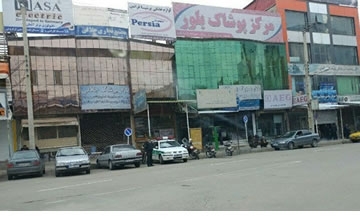 The Stores In The City Of " Baneh " Are Closed For More Than 20 Days . Baneh is a border city in Kurdistan province of Iran . " 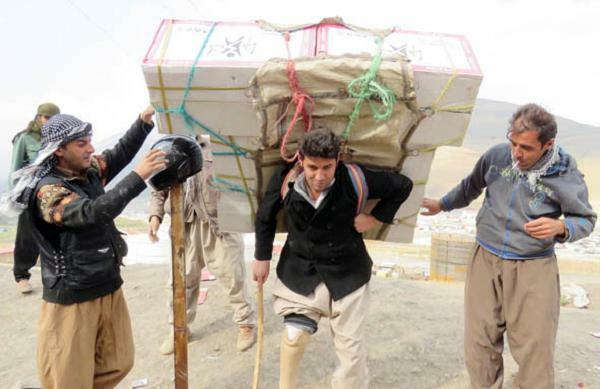 Kolbaran " are the people who cross the border by carrying business products at their back from Iraqi Kurdistan to Iran to be sold in the city of Baneh . Some of these Kolbaran carry the product of business people and receive money for delivery . 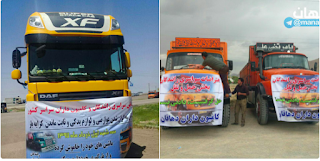 But regime put lots of pressure by killing , arresting , detaining these " Kolbaran " who deliver the products and receive little money to survive . 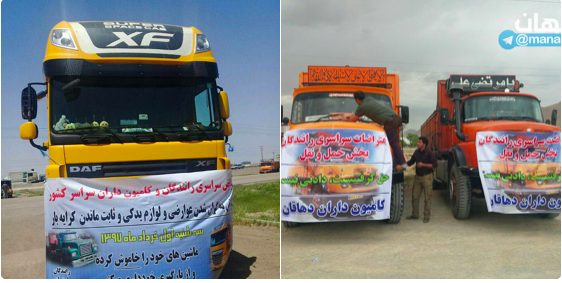 Because of regime policies towards Kolbaran and by banning these deliveries, Baneh business people went on strike and closed their businesses. 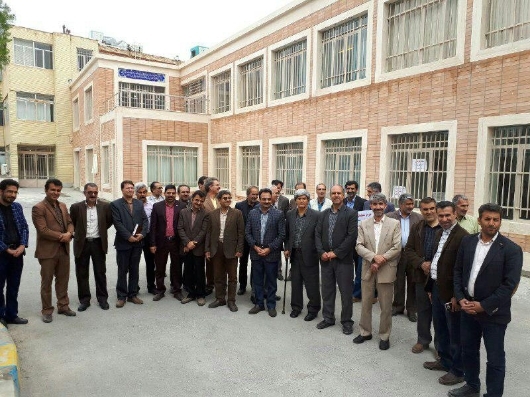 Its now more than 20 days that the businesses in the city of Baneh are closed.
" Kolbar" : Is a person who carries heavy market products from the border of Iraq- Iran to Kurdistan Market . 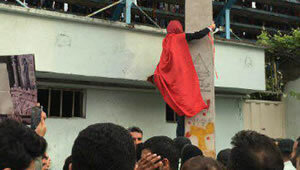 This picture shows a young women in the city of Babol ( Mazanderan province) is trying to use the hydro post to go up and be able to watch the championship festivities of her city soccer team " Khoneh Be Khoneh " . 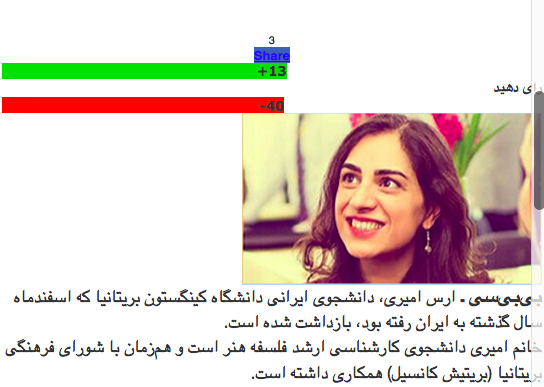 Aras Amiri is a student of Kingston University in Britain . 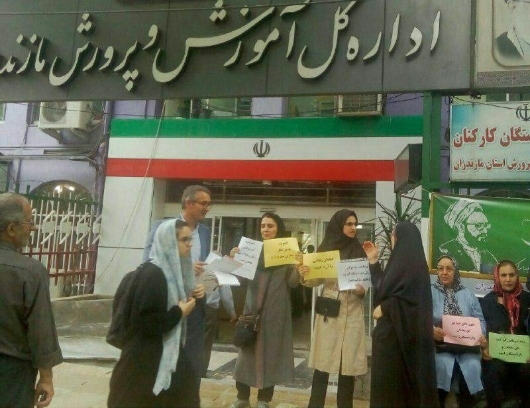 She was arrested on March when she returned to Iran . Ms. Amiri is in her last year of Philosophy of Art studies . She had also collaboration with British cultural council . 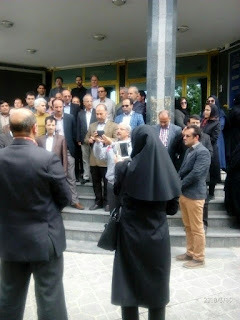 Mr. Mohsen Omani the cousin of Ms. Amiri spoke about her arrest by the agents of the Ministry of the Information when she returned to Iran and is in Cell 209 in Evin prison. 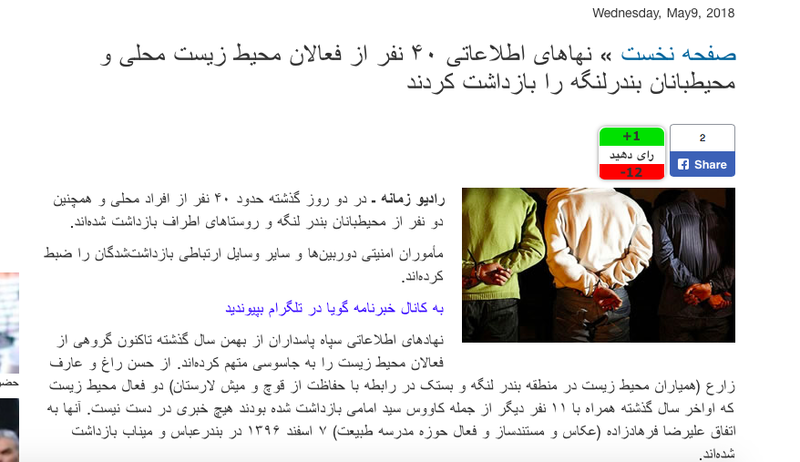 Aftab Yazd Newspaper published this and wrote : Does Khavari have any property in Iran to be confiscated ? 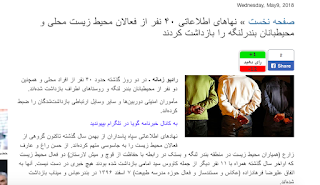 Why western countries speak about human rights while let people like Mahmoud Reza Kmhavari who served the totalitarian regime in Iran and to live a luxury life here in Canada with stollen money of Iranian people.....As if nothing had happened ......The double standard policy ? 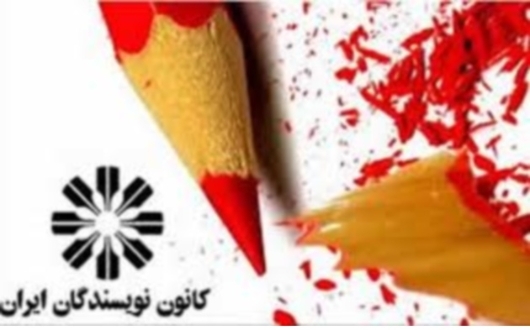 According to news The manager Of CAN Film Festival Requested from Hassan Rohani the president of the Islamic Republic to allow Mr. Jafar Panahi to attend the CAN Film Festival . In order for Jafar Panahi to be able to leave the country the ban on his travel abroad must be lifted. The American filmmaker also defended himself from attacks in the country's conservative press. 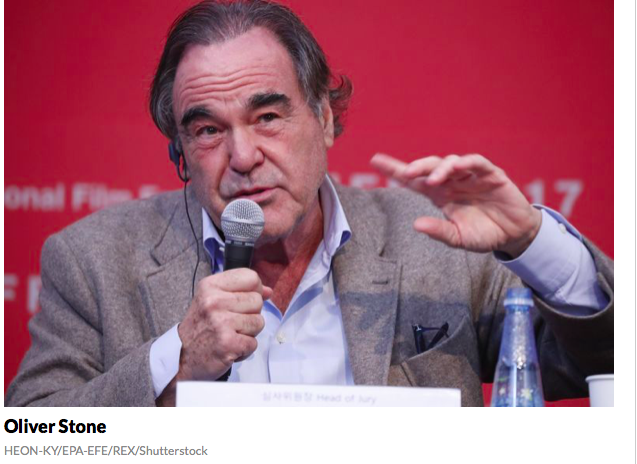 In a wide-ranging press conference held during his first visit to Iran, Oliver Stone expressed appreciation for Iran’s extensive history and recent cinematic accomplishments, criticized American policy toward the Middle East, and voiced his wish that director Jafar Panahi would be allowed to attend the Cannes Film Festival to witness the premiere of his latest film. Spending a week in Iran as a guest of the Fajr International Film Festival, Stone answered questions from a crowd of approximately 150 Iranian and a few foreign journalists in the Charsou complex in Tehran. He started out by saying that the early part of his visit took him to other Iranian cities, including Isfahan and he was impressed at the hospitality he had been shown and the “warmth” he felt from people of all walks of life. He said he had long been interested in Iran and its 2500-year history and was fortunate that the invitation from Fajr came when his schedule would allow his visit. There is still hope that Iranian Film Director Jafar Panahi can attend the Cannes film festival. His new film 'Three Faces' has been selected for the international competition, but it's uncertain if the director who is banned from travelling can come to France to present his film. 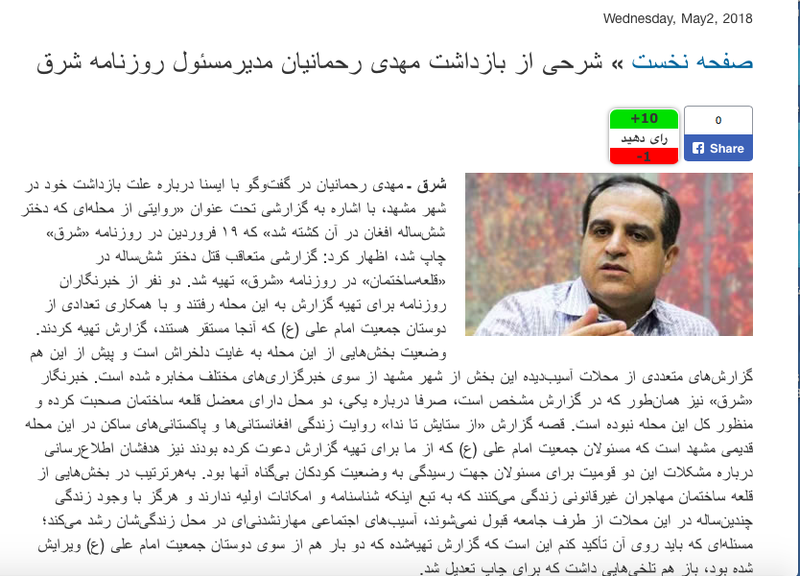 At the Fajri International Film Festival in Tehran, Euronews asked Iran's Minister of Culture if it might be possible for Jahar Panahi to attend the festival. 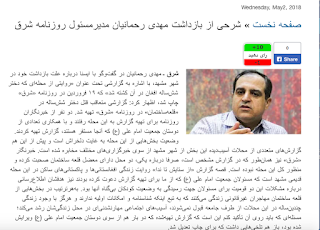 "Mr. Panahi's work can be seen at different festivals in various countries, which makes it possible for him to win different prizes," said Abbas Salehi. "But a final decision about this special question has not been made yet. There is still time to see what will happen." In 2010, Panahi was arrested by the Iranian authorities and banned from making films. He won the Camera d'Or at Cannes in 1995 for The White Balloon. Pahahi continues to work, but can't leave Iran and still faces a prison sentence which has not been enforced. 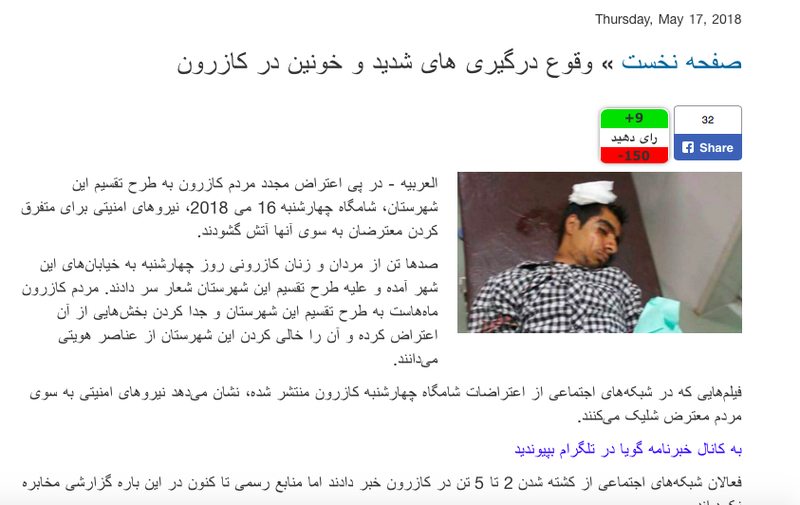 The reason for his arrest is because of a report Shargh reporters wrote about " the storey where a six year old Afghan Girl was killed in a district in the city of Mashhad known as " Ghaleh Sakhteman " where many Afghan and Pakistani refugees live . 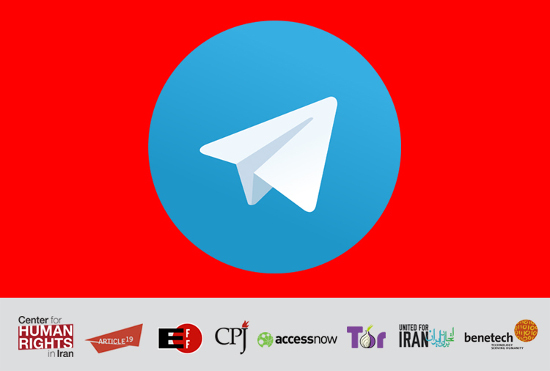 (Beirut, May 2, 2018) – The Iranian judiciary’s blocking of the messaging application Telegram is an unjustifiable restriction on freedom of expression and access to information, Human Rights Watch said today. 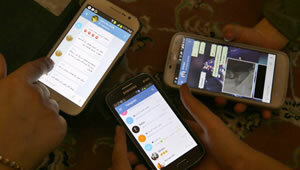 With more than 40 million users, Telegram had become the main social media platform for Iranians. 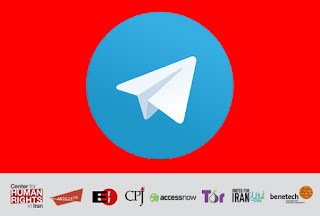 According to a report by judiciary power from Monday the Telegram application has been shut down in Iran . According to this report the reason for Telegram being shut down is because of several complaints against this social network . 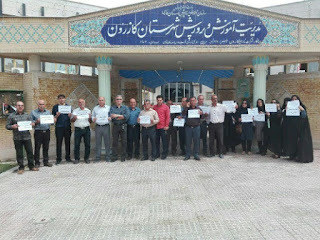 The public prosecutors of the court of revolution accused this social networks for : " disruption in national unity and creation of differences among the society ".